Catalonia’s separatists have shown no signs of abandoning their independence bid before an ultimatum from Madrid ends at 10am local time today (October 19). Instead, leader Carles Puigdemont has told his Catalan Democratic Party that not only will he not back down, he will press ahead with a more formal declaration of independence. His party seems to back him with spokeswoman Marta Pascal saying if the state decides to apply Article 155 he should make effective the mandate for independence given in the October 1 referendum. If there is no independence retraction Spanish Prime Minister Mariano Rajoy will move to impose direct rule on Catalonia. This prospect has raised fears of social unrest and led the euro zone’s fourth-largest economy to cut its growth forecasts and rattled the euro. Rajoy says the Catalan government has repeatedly broken the law, including when it held its banned vote on independence and made a symbolic declaration of independence on October 10, only to suspend it seconds later. Although he enjoys support in the national parliament, about 50 lawmakers yesterday held up posters in the chamber demanding the release of two jailed pro-Catalonia independence movement leaders, describing them as political prisoners. 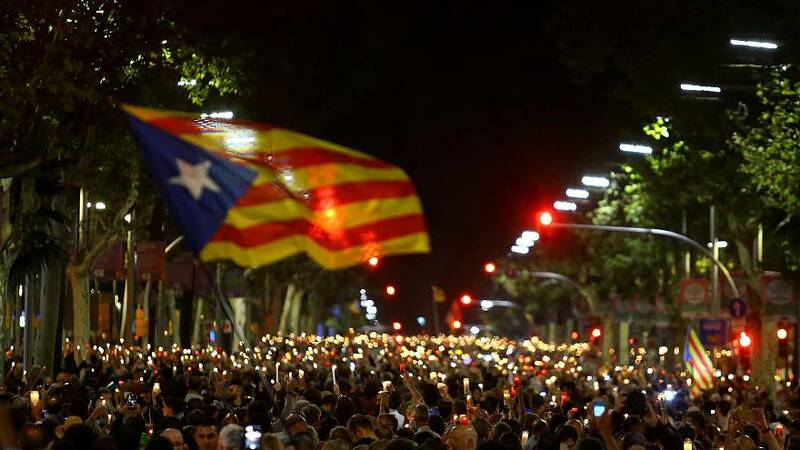 In the hours before Thursday’s 10am (October 19) deadline thousands of pro-Spanish unity demonstrators marched in the centre of Catalonia’s capital, Barcelona. The crisis which has divided the country is about to move into uncharted political territory.